Take a trip into the underworld of street racing and indulge yourself in this lurid midnight 5 reel game. Play online slots or stake real money in this fast and furious arcade inspired vintage classic. NetEnt was founded in 1994 and have since grown to become one of the leading games developers on the market. Their vast repertoire is filled with several award-winning games. The development team prides themselves on developing flexible digital casino solutions that deliver innovative online slot games. Today they serve over 170 of the world's most prominent casino operators, including us here at Wizard Slots , developing high-quality video and 5 reel slots. 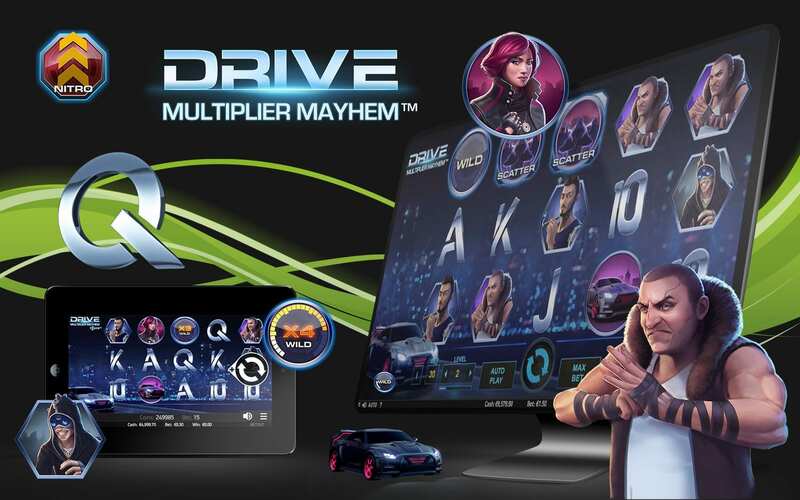 Drive: Multiplier Mayhem is filled with energy and fast-paced spins. If you love speedy cars then this futuristic world of racing is the perfect fit for you. It is easy to immerse yourself in the game with city lights that shine through the night in the background and the sound of a cat purring, bringing the reels to roll. If you're excited to play this game, you might also be interested to take a peak to the worlds best slot games online. You can find the letters J, Q and K, but also the number 10 on the 5 reels and 3 lines. In between, you will get to know the racers of the night. Jette, the lady with the pink hair, and her rivals: Twitch, who is crazy about racing, Hamaki, who is involved in some shady business that has left some scars on his face and the scary Bruiser, who's always up for a fight. When you successfully match three scatters on any position of the three middle reels you win 10 free spins and race as Jette against her strong competition. To beat them in a dangerous race you have to collect three nitrous on any reel and move on to your next opponent. To the side of the game board, you will see your nitro bar filling up as you race through the spins. On each free spin, you can re-trigger 3 further free spins several times. 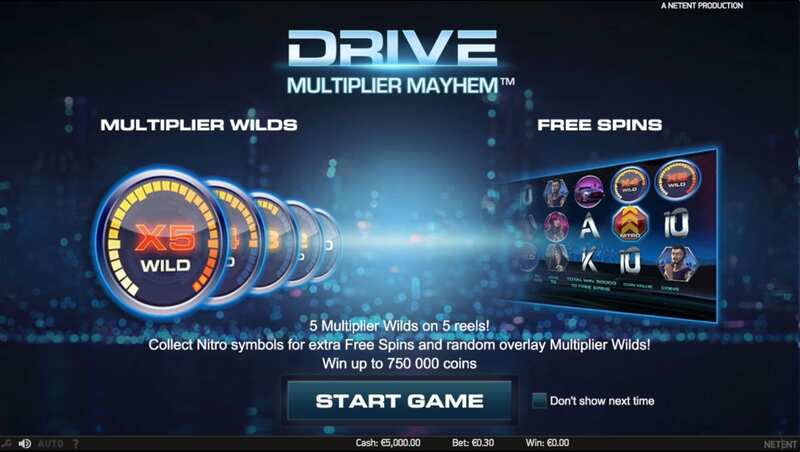 While the scatters bring you into an exciting side game, the base game of Drive: Multiplier Mayhem is all about wild multipliers that can reach up to a massive 120x your initial bet. To buy yourself into a race you will have to bet a minimum of 15 pence or up to 75 pounds. 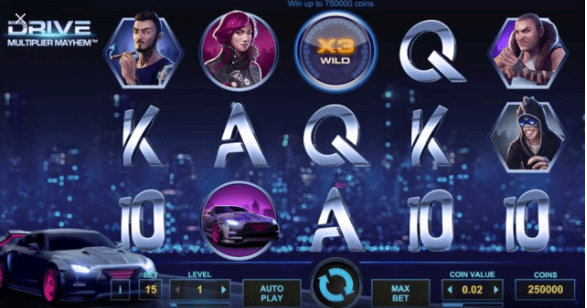 With 15 paylines and the opportunity to achieve some massive wins on the back of lucrative multipliers, your chances of getting to the finish line as one of the richest racers in town are perfectly feasible. The multipliers increase just as fast as the cars race against each other. Each reel has its own multiplier. Reel one is just wild, reel two has a 2x wild, reel 3 has a 3x wild, reel 4 has a 4x wild and reel 5 has a 5x wild. If you get two or more wilds on the same pay line, the multipliers are multiplied! So if you get a multiplier wild on reel three and on reel five you will get a multiplier of 15! Can you feel the multipliers coursing through your veins?